We make financing our products as convenient as enjoying them! 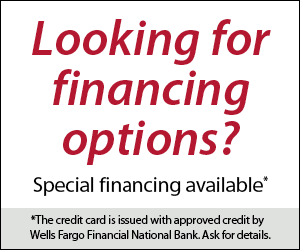 We are pleased to offer the Wells Fargo Financing program and the HFS Financing Program. HFS operates like Lending Tree does for home mortgages. You will receive several offers from different finance banks. Clicking the Wells Fargo image will take you to their application page. Put in the amount that you want to finance and they will notify of your new credit line. Clicking the HFS Financial image will offer two plans. One for financing less than $20,000 and one for financing over $20,000. Click the one you want and complete the short application. Once you submit, you will receive up to 11 offers immediately. Just select the one the best meets your needs. It is that easy to finance your new Hot Tub, Endless Pool, Sauna or Massage Chair from Great Atlantic! For all other inquiries, please fill out the form on the right and we will get back to you soon. Great Atlantic Hot Tubs & Saunas has three convenient showrooms with the latest Hot Tubs, Swim Spas, Saunas, BBQ Grills and Massage Chairs. All showrooms carry a full line of water care products for hot tubs and pools, as well as filters, equipment, accessories and other supplies.